The Maybach MD5211 trumpet is the next step-up in the Maybach line. 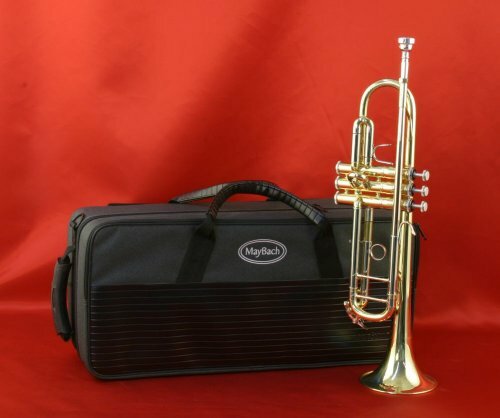 It is the upgrade to the M5210 student trumpet. The MD5211 is an outstanding value and offers Monel valves, silver nickel trim and double brace construction like the great pro horns. It has great tone and has top quality construction which both kids and parents will love. The trumpets sheer quality is why so many music tutors and schools recommend this horn to any budding trumpeter. Maybach instruments are of the same quality as those sold by the large national brands such as King, but cost a fraction of the price. The Maybach MD5211 is able to be sold at a fraction of a price, helping you save hundreds of dollars. Why pay more for a student trumpet if you don’t have to? This trumpet meets the needs of horn players who would prefer to buy a new trumpet rather than rent one that has been overused for several years and poorly maintained. This trumpet is teacher approved. Bring it to your teacher for their approval and we offer a 30 day absolute money back guarantee. You can buy this trumpet with knowledge and confidence that this is the perfect starter pack. The minute this trumpet arrives you will fall in love, it has a sound the likes you have never heard of before. The MD5211 comes with a terrific zippered canvas covered case which converts from a standard carrying case to a backpack in less than 1 minute. Making it much easier to carry than other trumpet cases out there. It is super duty and will protect the instrument from the rough handling given by students. This is the best trumpet we have ever sold under $400 !! Top Quality Intermediate Bb Trumpet in Clear Lacquer.